Welcome to my Jimdo vs Wix comparison. The truth is, neither one of these website builders is actually better than the other. They definitely have similarities but it’s the differences that are really going to set them apart and help you decide which is the best choice for you. With that said, let’s get stuck in. 1. Which is Easier, Jimdo or Wix? 2. Who Has The Best Design Templates? 5. Pricing – Which Offers The Best Value For Money? You’ll be pleased to hear that neither Jimdo or Wix is difficult to use but both will take a little time to find your way around as with anything new. With Jimdo, you create your website by clicking on the sample content which will then allow you to edit the text, upload your own images, and add/re-order elements on the page. Wix on the other hand, is what’s known as a true drag and drop website builder and allows you more freedom than Jimdo. You can pick up and drag elements across the page and drop them wherever you wish. Wix also has a larger array of website building tools to help you customize your site in comparison to Jimdo. Just keep in mind, if you stray too far from the original design without a good idea of exactly what it is you’re trying to achieve, you could end up driving people away from your site rather than attracting them! Both Jimdo and Wix have a very cool feature in common and that’s offering you the ability to create a customized business website by answering a series of simple questions. These features are known as Jimdo Dolphin and Wix ADI (Artificial Design Intelligence). After you’ve answered the questions, the software goes to work building your site with industry related images, contact forms, and sample text. They even have the ability to pull existing business information from your social media profiles. Once complete, you’ll then have to spend a little time editing your customized website until you’re happy. At this point in time, I’ve only tested Wix ADI but plan to put Jimdo Dolphin through its paces soon. Ease of use summary: Jimdo and Wix are well known for being user-friendly even for beginners. Wix has more tools which may seem a little daunting at first but won’t take long to get used to. Both platforms offer a more hands-off approach to website building thanks to artificial intelligence. The first thing to note here is, both Jimdo’s and Wix templates are mobile-friendly meaning your site will look good and function correctly on smartphones and tablets. Having said that, you may have to have a little play around with your Wix mobile site just to make sure everything is where it should be before you go live. Now, Jimdo’s design templates have always been a bit of a sticking point for me and I believe that this is one area where they’re seriously lacking compared to the competition, especially Wix. It’s not that the templates are bad as such, but there’s only a tiny selection (less than 20) and they look as if they could do with being dragged kicking and screaming into 2018! Wix’s templates, on the other hand, sit at the other end of the scale. You won’t be stuck for choice here, as Wix have over 500 to choose from. They look modern, and they are all categorized by industry so you can easily find what you’re looking for. Choose from business, online stores, photography, music, portfolios, beauty and wellness and many more. As I mentioned earlier, you have a lot more freedom to customize your chosen template and really make it your own. The only real downside to Wix’s templates is that once you’ve made your choice, you’re stuck with it unless you start over whereas, with Jimdo, you can change it as many times as you wish. Templates summary: Both Jimdo’s and Wix’s templates are mobile-friendly. Jimdo allows you to change your template on the fly where Wix doesn’t. 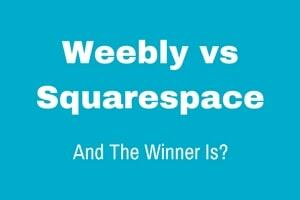 When it comes to quantity and quality, Wix is the clear winner. Image galleries to display your photo’s or showcase your work. e-commerce features to sell products directly through your website. Easily add a blog to your site. Social media integration so visitors can share your content. Google Analytics integration to track your website visitors. # Create an online store: If I was creating a small or medium online store today, I’d seriously consider Jimdo. They have a great set of easy to use eCommerce tools and it’s super simple to set up your store and sell physical & digital products online. Your store will have its own shopping cart, you can have variations of products such as size an color and even assign a different item number to each of them. You can set shipping rates by country, track your inventory, offer discounts, and your customers can shop safe in the knowledge that your site is secure with SSL encryption. # Create your site on the go: Personally, I like to use my laptop while I’m at home for pretty much everything but I know not everyone does. If you prefer to use a smartphone or tablet, Jimdo has an app for IOS and Android users that allows you to create and manage your website from your mobile device. Currently, Wix doesn’t offer this feature. # Free personalized email address: Should you sign up to one of Jimdo premium plans, they will throw in a personalized email address to match your domain free for the first year (for example; contact@yourwebsite.com). I know this may not seem like a huge deal, but when you consider that with Wix it’ll set you back an extra $45 per year (approx) on top of your plan, you may just change your mind! 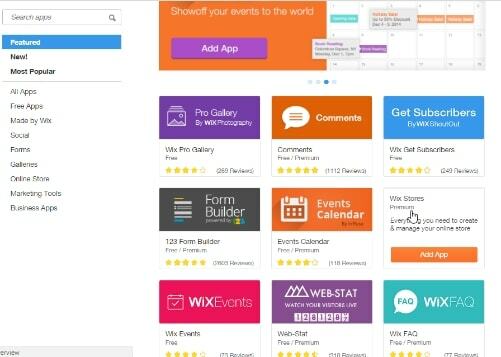 # Wix App Market: Unlike Jimdo, Wix has a digital ton of add-on features (apps) available that allows you to quickly add extra layers of functionality to your website. Inside the App Market, you’ll find a plethora of tools such as online booking forms for businesses, hotels & restaurants, form builders, PayPal buttons, visitor stats, and invoicing software. I should point out that some apps may come with additional costs but have a free trial. Jimdo doesn’t have an app store and instead, simply recommends third-party integrations. # Customize your mobile site: Wix has a separate editor where you can to customize the mobile version of your site. You can add elements, remove them, and even re-arrange them to offer your mobile visitors a more streamlined experience. All the time the desktop version of your site will remain just as you left it. You can also add a Mobile Action Bar that displays at the bottom of the screen that visitors can “tap”. When they do, your contact details will be displayed such as your email address and phone number and potential customers can simply click the phone number to call you. Features summary: Both Jimdo and Wix provide have enough features to help you create a fully functional website whether it’s for a hobby, business, or online store. Jimdo really shines for when it comes to their eCommerce tools, mobile app, and free personalized email address. Additional features can be added with Jimdo’s recommended third-party integrations. Wix, on the other hand, has many of those features in-house such as online booking forms, hotel bookings, restaurant reservations etc. They can all be added with just a click. Their mobile editor also allows you to customize your mobile website. I’ve personally tested both support teams when creating my test site and was pleased with the timely help I received. 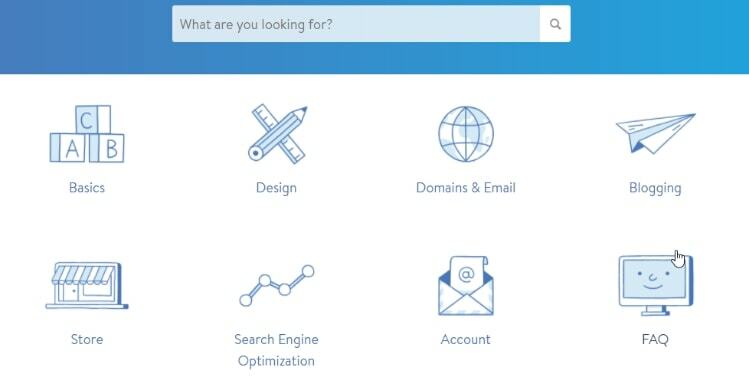 Jimdo has put together a well-stocked support center containing tutorials covering a wide range of topics including setting up your site, basic design, how to add and manage a store, and how to get your site ready for the search engines such as Google. If you need to speak to a member of the Jimdo support team, you can get in touch with them by their email based ticket system or live chat (9-5 Pacific time). They also have a user forum where you can ask questions (and browse previous ones), or you can use the email ticket system or request a callback if you’ve exhausted other options and require phone support. Support summary: Jimdo and Wix both offer written and video tutorials to help you set up and design your website. When you need to speak to a member of the team, you can contact Jimdo through their email ticket system or live chat feature depending on your time zone. Wix offers email support and you can request a callback if you need to speak to someone on the phone. So, does Jimdo or Wix offer the best value for money, that’s what you really want to know right? Unfortunately, comparing website builders on price is always a tough thing to do as no two plans are the same and there are usually other costs that have to be considered. First off, both Jimdo and Wix offer you a “free website”. You don’t need to enter your credit card details and you can keep the sites for as long as you wish. Jimdo’s free plan is quite flexible and displays a small discreet advertisement at the bottom of the page whereas Wix ads are a little more in your face! Jimdo offers two premium plans, JimdoPro and JimdoBusiness which cost $7.50 per month $20 per month respectively. These prices are for an annual plan and are billed upfront. Jimdo’s free plan is good for basic websites, JimdoPros offers more functionality, and if you’re creating an online store, you’ll need JimdoBusiness. Wix offers a wider selection of plans which range from $5 to $25 per month (annual plan, billed upfront). One thing that I find annoying is that their cheapest plan still contains ads. For a functional business site, Wix’s Combo ($10 per month) or Unlimited plan ( $14 per month) are good options and if you’re setting up a store, their eCommerce plan is only a few dollars extra at $17 per month. 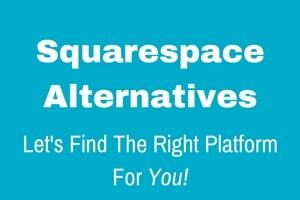 Both platforms offer you a free domain name (web address) for one year with an annual plan. Jimdo offers a free email address for the first year. 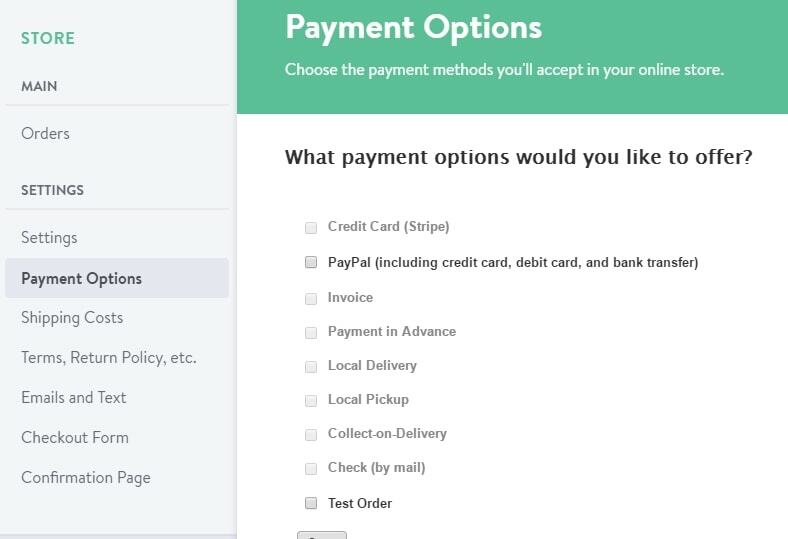 Wix will cost an additional $45 (approx per year). Pricing summary: Jimdo and Wix both offer you a free plan (with restrictions) and a free domain name for the first year. Jimdo also offers the benefits of a free email address for the first year and is the cheaper option for a small business website or portfolio. Wix has more features and is the cheaper option for an online store but there is a more expensive plan with priority support and more advanced features. Although an important consideration, I don’t think there’s a big enough difference to base your decision on price alone. Both website builders are easy to use but Wix allows more freedom and has a wider selection of templates to help you get started. Jimdo’s a solid choice for people whose first language isn’t English, they have a strong focus on eCommerce, and they even throw in a free email address for the first year saving you a few dollars (read my full Jimdo review). Wix also has great eCommerce tools, they allow you to customize your mobile site and thanks to the Wix App Market, there are a plethora of add-on features that can be installed with a single click allowing you to add extra functionality to your site (read my full Wix review). As I usually say in these situations, the best thing to do is create a free account with both Jimdo and Wix (links below) and spend an hour with each platform. This should be more than enough time to get a feel for them and decide which one is the best fit for you. Visit Jimdo – Take Jimdo for a free test drive! 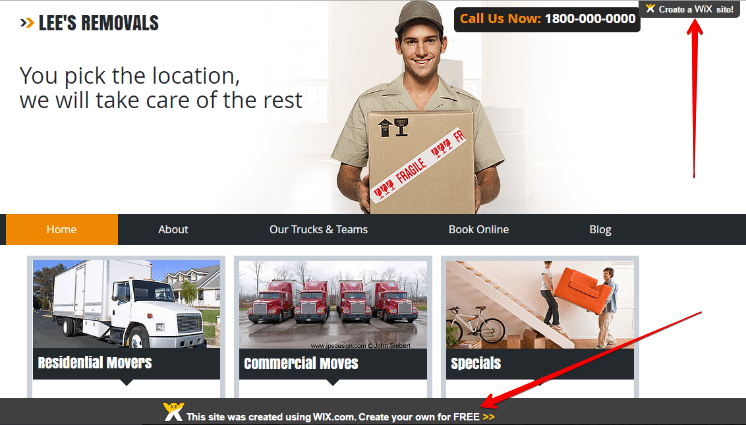 Visit Wix – Try Wix yourself for free! If you have any questions about Jimdo or Wix, or you’d like to share your experiences good or bad, fire away in the comments section below and I’ll get back to you as soon as I possibly can!